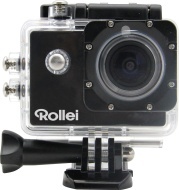 alaTest has collected and analyzed 182 reviews of Rollei Actioncam 420. The average rating for this product is 3.5/5, compared to an average rating of 4.0/5 for other Camcorders for all reviews. Opinions about the portability and image quality are generally positive. The size and price also get good opinions, whereas the viewfinder and battery get less positive opinions. We analyzed user and expert ratings, product age and more factors. Compared to other Camcorders the Rollei Actioncam 420 is awarded an overall alaScore™ of 81/100 = Very good quality. alaTest has collected and analyzed 7 user reviews of Rollei Actioncam 420 from Amazon.co.uk. The average user rating for this product is 3.4/5, compared to an average user rating of 4.0/5 for other Camcorders on Amazon.co.uk. People are impressed by the battery and zoom. The portability and usability are also appreciated, whereas many are critical about the viewfinder. alaTest has collected and analyzed 1 user review of Rollei Actioncam 420 from Amazon.com. The average user rating for this product is 2.0/5, compared to an average user rating of 3.9/5 for other Camcorders on Amazon.com. People really like the portability. 0% of the reviews on Amazon.com give this product a positive rating. As you can see I really like this monitor. Bright, color correct and very active. This was a gift to a staff member who lives in Alaska and when she received it she'd never been more excited. She immediately hooked it up and completely loves it. The cost was reasonable and it was shipped on time and arrived safely. So far so good, my mother loved the size and I loved the price and quality. Nice sized monitor, a good price. easy set up but should have come with a DVI cable. Good price for a very serviceable monitor - don't expect a super sharp picture. Good for an office setting.